… just because it sounds like it has overprotective parents? What would they do if I just patted the side of the building? Spider mum, a photo by rjknits on Flickr. We’re all feeling a little bit frazzled and tired, now that normal working hours are back. Me, I think my tact is broken. How about you? 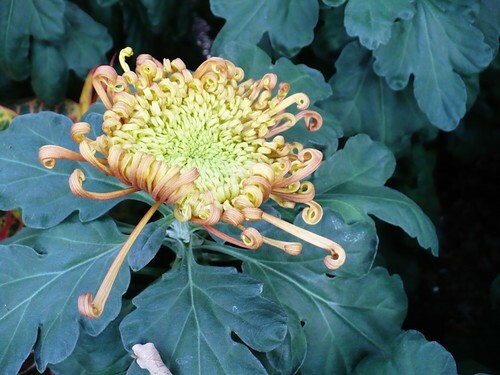 But the Chrysanthemum festival at Longwood Gardens — that is worth going to see! We’ve had a rare flurry of activity — a trip to picnic with friends, guests 2 weekends in a row, concerts to attend, and the normal excitement of getting a garden ready for summer. Last week, I washed off the deck chairs with soap and water. We started work on taming the rogue hedge in the front yard. 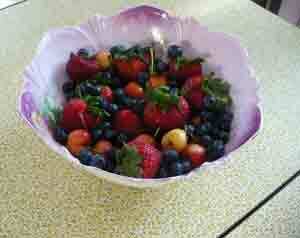 And, because there were guests coming, I treated myself to a very delicious selection of fruit at the market. By the end of one 4-person dinner, the entire large bowl of fruit I prepared was empty. I think I ate most of the cherries that were in the lot. But… easy, and I didn’t need to heat up the oven. I do think the photo is funny, though: Victorian transferware bowl, on a formica topped table (probably from the late 50s early 60s), and a classic still live for berries from May. Not quite “The House Beautiful”, yes? It isn’t quite as candid as Magnusmog’s post about the items around photos that she crops out (although I hadn’t seen this particular breakfast table cleared of everything since sometime in December, if I would be honest). Yellow is sunshiny, bright, and cheerful. It can go from subdued and muted, to loud and bold. From the pale yellows of sorbets to the loud yellow of bright sunflowers. It can be a challenge to wear. 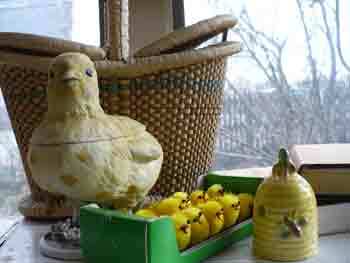 Thank heavens that daffodils embrace the challenge, cheering up spring with their nodding heads. More photos on flickr here. 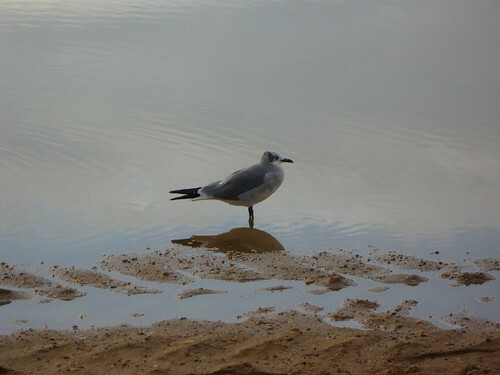 Seagull in a pool of water, a photo by rjknits on Flickr. For Project Spectrum (September), I went to one of the beaches by the bay, and looked for natural yellow elements. The sand and yellow reflections on the water here, made for a fun picture. Alas, no knitting for the color yellow was done. I’ll post other images, once I’ve sorted through them. But this one sums up the end of summer and beginning of autumn for me — bittersweet and filled with rain. And fuzzy body spritzed by dew. Drawn up against the chilly air. In a stand of half-furled chrysanthemums. And stare up at the maroon sky….